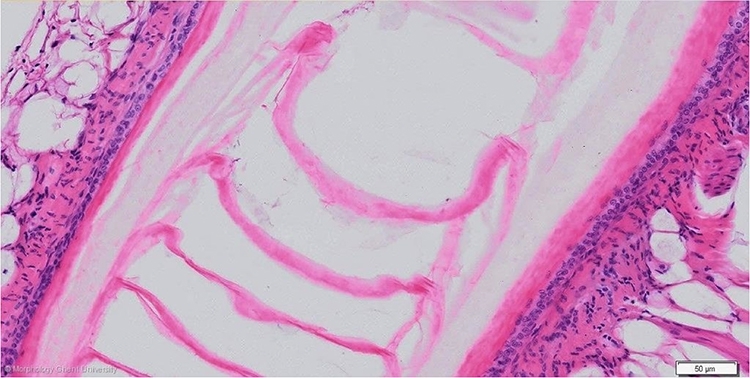 Longitudinal section of the follicle and calamus of a grown contour feather of a chicken (HE): detail of the epidermis of the follicle and of the wall of the calamus. The stratum germinativum of the epidermis of the follicle is a single layer of cuboidal cells which is covered by a stratum corneum with flattened and compacted cells. Corneous connection sheets that run between the follicle wall and the wall of the calamus, together with tonic action of the feather muscles, hold the feather tightly in the follicle cavity. The wall of the calamus is a cornified layer that arises from the intermediate layer of the epidermal collar. Inside, the wall of the calamus is lined by the outer pulp membrane, a thin corneous layer formed by the innermost, basilar layer of the epidermal collar. The pulp cavity is divided in pulp cap cavities by strands of corneous pulp caps (galeri pulposi).